The Brazilian midfielder has excelled in China and is now reportedly coveted by the La Liga giants. 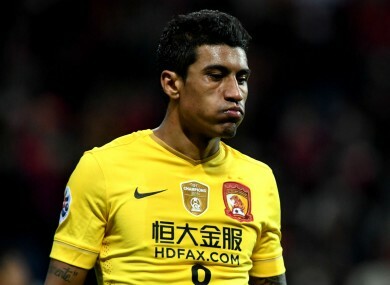 BARCELONA ARE NEGOTIATING with Guangzhou Evergrande over the potential signing of Paulinho, according to widespread media reports. Premier League fans will be familiar with the Brazil international, who had a torrid two-year spell at Tottenham and was voted as the club’s worst-ever player by supporters. Barca’s negotiations are still at an early stage, though they also enquired after Paulinho’s availability at the turn of the year. Paulinho has played for Guangzhou for three seasons, winning two league titles and the Asian Champions League. Bayern Munich were also interested in signing Paulinho during January, and Carlo Ancelotti had a phone call with the midfielder, though the negotiations did not reach a conclusion. Paulinho has made 87 appearances for Guangzhou, scoring 24 goals. Email “Barcelona open talks with Tottenham flop Paulinho”. Feedback on “Barcelona open talks with Tottenham flop Paulinho”.